Was St. Joseph present at the Visitation? In previous articles we have considered what St. Joseph may have thought when he learned of the conception of the Christ Child and also have compared the evidence from Sts. Matthew and Luke to attempt to create a harmony of the events from the betrothal of St. Joseph and the Virgin through the finding of Jesus in the Temple, our purpose in the current article is to elaborate an additional point which was already covered briefly – Was St. Joseph present at the Visitation? After briefly establishing the relevant points made from the previous articles, we will consider the arguments in favor of St. Joseph’s presence followed by those opposed to it. 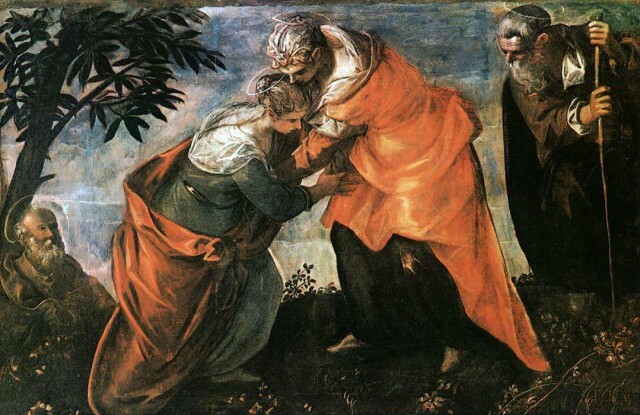 In so doing we do not attempt to establish dogma or come to absolute certainty, rather we only desire to gain some understanding of the historical reality of the Visitation of the Mother of God to St. Elizabeth. Certainly, a careful consideration of the Gospel text, together with the tradition of the Fathers and Doctors, will be of great aid to us as we make a meditation upon this mystery. Specifically, we recall that imaginative prayer (especially, that which is in the Ignatian tradition) is deeply rooted in the historical circumstances and details of the mystery – one simply cannot effectively engage this event in imaginative mental prayer without considering whether or not St. Joseph was present. 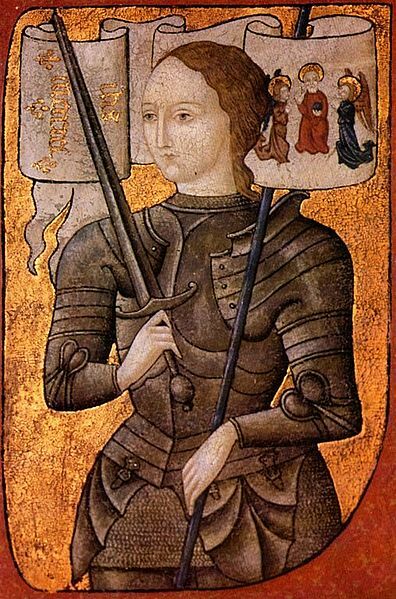 580 years ago, “at Rouen, St. Joan of Arc, Virgin, called the Maid of Orleans, who, after having fought bravely for her fatherland, was at length delivered into the power of her enemies and was condemned by a wicked judge and burnt at the stake. Benedict XV, Supreme Pontiff, inscribed her name on the roll of the saints.” (from the Roman Martyrology) The courageous Maid died at the age of nineteen. Should confirmation be delayed? Reflecting on the "restored order"
Currently, there is a movement in the United States and in Europe (and perhaps in other places) to move the age of confirmation lower. In recent times (that is, in the past three centuries or so), confirmation had been delayed until early adulthood. 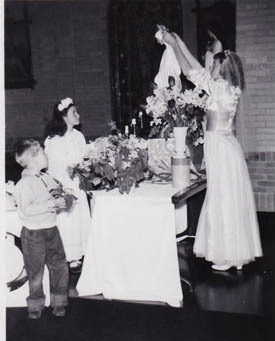 Moreover, first communion was often not received until this time of greater maturity (perhaps in the early teens). 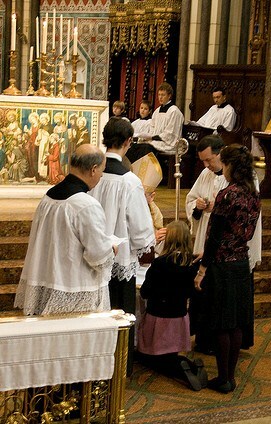 However, especially with the impulse of Pope St. Pius X, first communion was restored to the time of the age of reason (around the seventh year); however, until recently, confirmation was not moved up to this earlier age but remained to be received many years after first communion. Certainly, the very recent lowering of the age of confirmation has caused some alarm among lay faithful and priests alike. In this article, we intend to look at some of the main concerns on both sides of the issue, and to discuss the nature of the relation between confirmation and first communion. This discussion will be concerned only with the practice of the Latin Church, as the issue is dealt with quite differently in the East. They sent them Peter and John, who went down and prayed for them, that they might receive the Holy Spirit, for it had not yet fallen upon any of them; they had only been baptized in the name of the Lord Jesus. After having been baptized by St. Philip (the deacon, not the apostle), the Christians of Samaria still had need of the full outpouring of the Holy Spirit which is given through the sacrament of confirmation. To this end, it was fitting that the apostles in Jerusalem sent Sts. Peter and John (apostles) to bestow the Holy Spirit through the laying on of hands. In this event, we see both that confirmation is a sacrament distinct from baptism and that it is most necessary in the life of the Church and of the individual believer. It will be fitting for us to reflect upon this sacrament, since this liturgical season is the time most commonly set aside for the administration of confirmation in dioceses throughout the Latin Church. Recognizing that St. Luke tells us that the Samarian disciples had not yet fully received the Holy Spirit, since they had only been baptized and had not been confirmed; we are led to the following question: How necessary is the sacrament of confirmation? Is spiritual direction really for everybody? It would seem that Pope Benedict XVI believes that every Christian adult must avail himself of spiritual direction in order to reach perfection in Christ. Certainly, this would come as a surprise to many, since there are relatively few Catholic faithful (even among the most devout) who regularly engage in spiritual direction. Indeed, we must admit that, if every Catholic were to seek formal spiritual direction, there would hardly be enough priests and other spiritual persons to serve as directors! Even if every priest were as devoted as St. John Vianney, I doubt that there would be enough time for him to offer personal formal spiritual direction to each and every member of his flock. Still, the Holy Father has spoke and we must seek to understand the meaning of his words. Are we to conclude that spiritual direction is for all Christians? What sort of direction? And how much is needed? Did Jesus know the day and the hour of the Apocalypse? In the midst of the recent apocalypse fiasco, it was not uncommon to hear well-meaning preachers state that “No one knows the time of the end of the world. 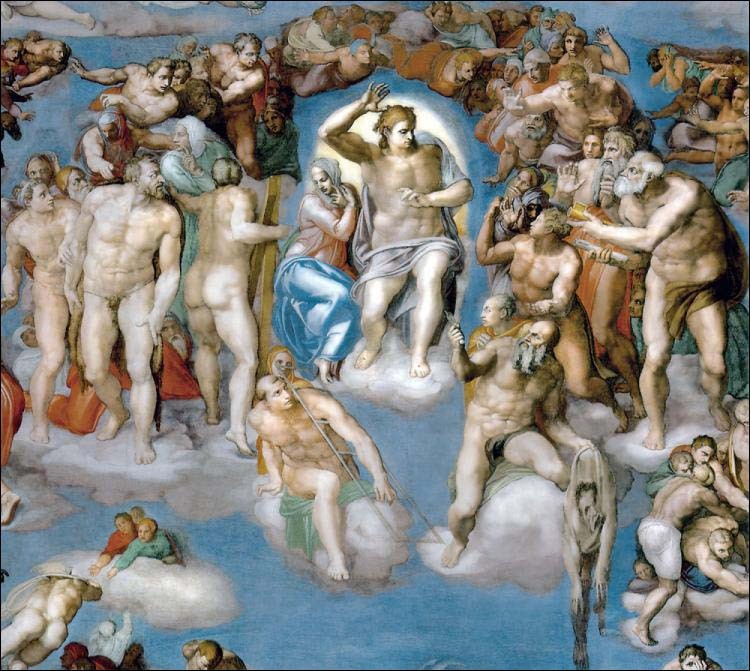 Not even Jesus knew when the second coming would be, that’s why he said no one knows, not even the Son.” Indeed, even many Catholics have a tendency to think in this way – whether explicitly or (more often) by an implicit concession. Thus, it may come as a surprise to many to learn that this claim (that, in his humanity, Jesus did not know the day and the hour of the Final Judgment) has been condemned by several popes as a heresy. In fact, it would be impossible to hold this view without implicitly maintaining either the heresy of Nestorius (dividing Christ into two persons, one human and the other divine) or of Arius (denying the divinity of Christ all together). Are there two personalities in Christ, a human "I" and a divine "I"? It is popular for modern(ist) theologians to speak of two personalities in Christ. Some have gone so far as to claim that there are two persons in Christ – and, to us, it is difficult to understand how such speculation on the part of certain scholars has not yet been openly condemned as heresy. On account of the one person of Christ, the Church prays in her Creed: I believe in one Lord Jesus Christ. This means not only that Jesus Christ alone is the Lord, but also implies that he his one. Christ the Lord is one, he is not two – thus, though he is both human and divine, Jesus is one divine person which is the person of the Eternal Word. Still, it is common enough for these modern theologians to speculate regarding the personality of Christ, they ask: Granted that the Lord is one person; is it yet possible to claim that there are two personalities, one human and one divine? We admit that the Church has not yet pronounced on this issue; however, for reasons which will be manifest below, we argue that it is not safe for a Catholic to suppose that there are two personalities in the one person of our Savior. 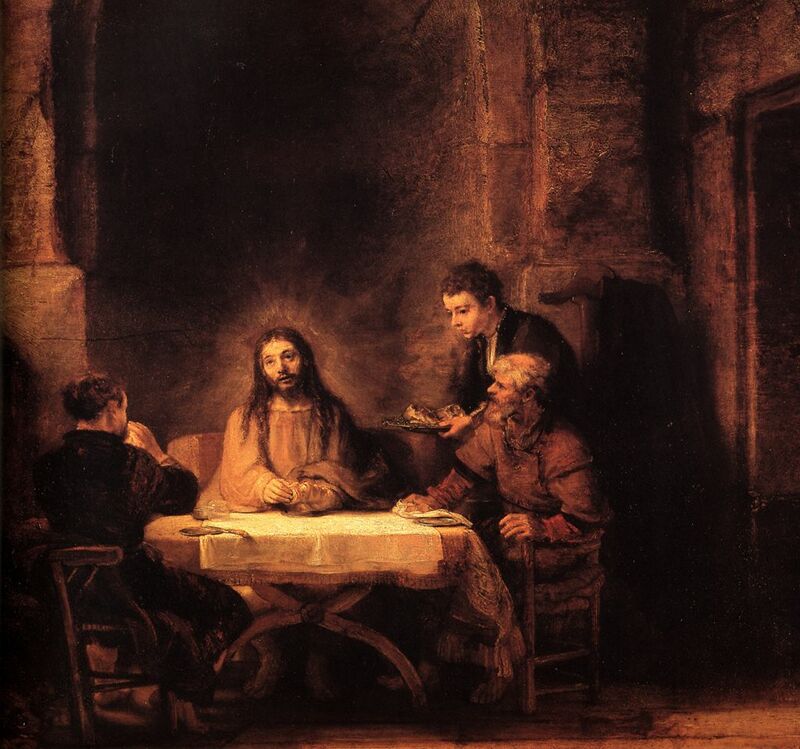 Our Savior tells St. Thomas the Apostle, I am the way, and the truth, and the life (John 14:6), but we might ponder in what sense the Lord is each of these three. Is Christ the Way in the same sense that he is the Truth and the Life? What is it about the Lord that makes him to be the Way, and what makes him to be the Truth and the Life? The greatest Catholic biblical scholar and theologian, St. Thomas Aquinas, plumbs the depths of this mystery as he comments on this verse from St. John’s Gospel. As we consider our Savior’s words, under the guidance of the Angelic Doctor (cf. 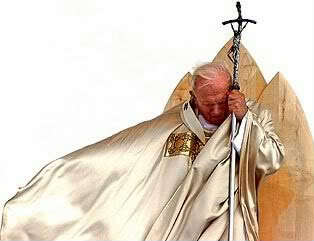 Vatican II, Optatum Totius 16), we will find who our Lord wants to be for us, and who we are called to be in him. In the Ordinary Form of the Roman Rite, the Church heard St. Paul’s speech in today’s first reading. St. Paul concludes his sermon with a reference to St. John the Baptist’s words, Behold, there cometh one after me, whose shoes of his feet I am not worthy to loose (Acts 13:25, cf. John 1:27). As we consider these words more carefully, we will recognize that this is a subtle reference to the Law of Moses – and we realize that, in unexpected ways, the Old Testament often shines much light on the New. Pope St. John I was a great defender of the truth of the divinity of the Son of God and died on May 18th in the prison of the Arian King Theodoric at Ravenna in 526, having served the Church as Supreme Pontiff for two years, nine months and seven days. His remains were translated to the Basilica of St. Peter in Rome on May 27th, the day in which his feast is commemorated in the Usus Antiquior. Additionally, this holy pontiff worked to maintain unity between the East and the West and helped to establish the current mode of calculating the date of Easter (in the Latin Church). By the time of Pope St. John I, it had already been determined that the yearly calculation of the date of Easter would be somewhat independent of the date of Jewish Passover – insofar as Easter would always fall on a Sunday, even when the Passover fell on another day. Still, there was diversity of opinion as to just how independent the Church should be from the Jewish traditions. How can it be that the Lord would declare that all others, as many as have come, are thieves and robbers (John 10:8)? 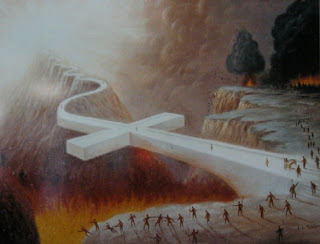 Is it true that all who came before are untrue and are blind leaders of the blind? What shall we say of Abraham, Moses, and Elijah? What of John the Baptist? Were these thieves and robbers? Certainly not! It is clear enough, especially from the context of our Lord’s words, that those others, those who came before, those whom the good Shepherd calls thieves and robbers, these are the Pharisees who bound up heavy burdens for the people but did not lift a finger themselves. The Pharisees and Sadducees and all those who come not from God but from the world, these are the hireling whose own the sheep are not, who seeth the wolf coming, and leaveth the sheep, and flieth. Indeed, these ones are nothing less than wolves in sheep’s clothing. Moses and Elijah are not among these. But how can it be that all who came before are said to be thieves, while Elijah who is come (i.e. 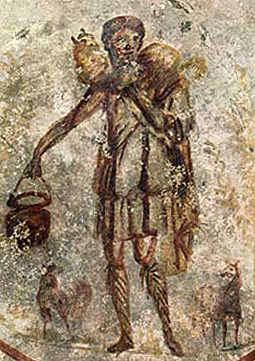 John the Baptist) is not a thief? 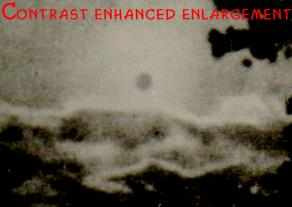 On October 13th, 1917, in the presence of as many as 100,000 people (both believers and non-believers) who had gathered near Fatima in Portugal, according to eyewitness accounts, the sun began to dance in the sky and then appeared to fall toward the earth before once again returning to its normal size and place in the heavens. May is Mary's month, but why? Yet, although many Catholics know that May is dedicated to the Mother of God, it may be a bit of a puzzle as to why May was chosen for this special honor. What is it about May that makes it suited to be the Month of Mary? Ad orientem and Communion kneeling, "Let us break bread together on our knees"
That very day, the first day of the week, two of Jesus’ disciples were going to a village seven miles from Jerusalem called Emmaus, […] One of them, named Cleopas. St. Cleopas, one of the disciples who met the risen Lord on the road to Emmaus, is commemorated in the Roman Martyrology on 25 September. 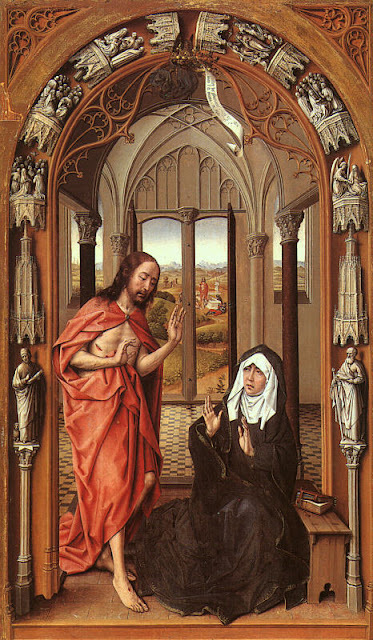 While little is known with certainty of either him or his companion, there is a tradition which identifies this Cleopas (or Cleophas) with the wife of Mary (the mother of James the Lesser). Furthermore, some speculate that he was the brother of St. Joseph, the spouse of the Virgin Mary. We will consider the tradition as expressed by the great biblical scholar Fr. 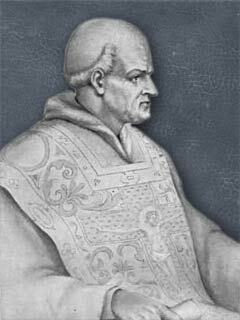 Cornelius a’ Lapide, sj (d. 1637). 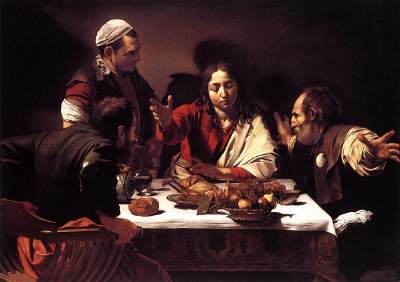 The Catholic Encyclopedia, however, does not follow the Jesuit on this point, and argues instead that there were two men named Cleopas and that, while the other may have been the brother of St. Joseph, the history of Cleopas of Emmaus is almost entirely unknown. With that their eyes were opened and they recognized him, but he vanished from their sight. In our commentary on the Gospel for the 2nd Sunday of Easter, we considered two of the qualities of the resurrected body of Christ: Impassibility and subtlety. Now, we look to the final two qualities of the glorified body: Agility and clarity. Agility describes rapid movement, while clarity denotes a particular brightness in appearance (i.e. the resurrected body shines). Just as impassibility and subtlety were the means by which Christ entered into the locked room by walking through the walls and yet was able to be touched by St. Thomas, so too it is by virtue of agility and clarity that the Lord walked along with the two disciples on the way to Emmaus but then vanished from their sight. If Jesus had a true, physical body after his Resurrection (and if it was a body at all, it must have been physical), how is it that he appeared in an unrecognizable form to Cleopas and his companion and then, immediately upon being recognized by them, disappeared all together from their sight? 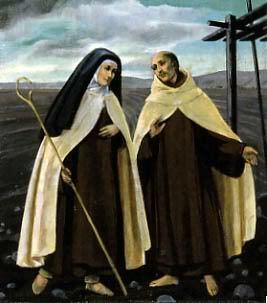 At Ostia, the birthday [into heaven] of St. Monica, mother of blessed Augustine, to whose illustrious life he bore witness in the ninth book of his Confessions. As we consider, in the month of May, the most intimate communion which existed between the Mother of God and her only Son our Lord Jesus Christ, it will be well for us to recognize the grace of God at work in his saints. How else might we hope to gain insight into the love our Lord has for our Lady than to consider the love of a saintly son for his holy mother? 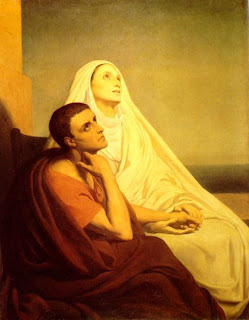 To this end, we look to St. Augustine’s words in memory of his mother St. Monica (Confessions IX, 8-13). 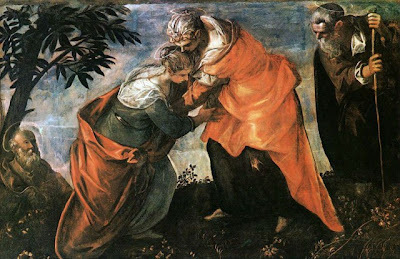 Did Jesus appear first to his Mother after the Resurrection? As we begin the month of our Lady, still early in the Easter season, it will be most profitable to consider whether the Blessed Virgin Mary was the first to be visited by the risen Lord. 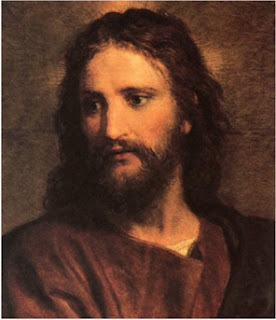 While it has never been a teaching of the Church that Jesus appeared first of all to his Mother – this fact has not been handed down to us either by Scripture or by Tradition, and hence is not an article of the faith – it has been held by a long-standing and well honored tradition, one which has been confirmed also by many private revelations. We ask: Did Jesus appear first to his Mother after the Resurrection? And we presume that the answer to this question contains also the answer to another: Did Jesus ever appear to his Mother after the Resurrection? Indeed, if Christ did appear first of all to Mary, then the answer to our second question is in the affirmative. However, if the Lord did not appear to the Virgin Mary first of all, we might suppose that he never appeared to her – since, it would seem unfitting that she would receive her Son only after others. Certainly, a negative answer to the first question does not necessitate a negative answer to the second – it is possible that our Lord would have appeared to his Mother later. Still, if Jesus did not appear to his Mother first, then we might well question whether we should suppose that he appeared to her at all. We enter now into a highly theoretical and speculative question. We do so with great humility and reverence for the mysteries we contemplate. The relationship between a mother and son is always a matter which an outsider must hand with extreme delicacy, and how much more is this the case when considering the Virgin Mother and her divine Son! In 1979, his Holiness Pope John Paul II visited Madison Square Garden in New York City. Below is a video of a portion of that memorable day. Notice how the great John Paul does not hesitate to humble himself to reach those present – as a good father speaks in a sort-of baby talk to his children, the venerable Pontiff is moved by the Spirit to relate to his audience in a child-like manner, Unless you be converted, and become as little children (Matthew 18:3).